I started blogging in 2009. We all know that in any pre-blogging phase, there involves a lot of fan-reading and ogling and the "getting-inspired" mood and yeah DIRTY FLAWS was one of my go-to blogs back in the day (up until now). 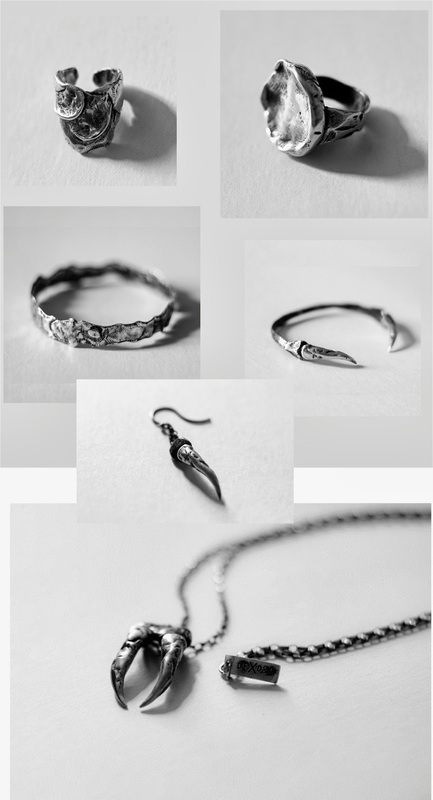 So when my good friend JAKE ANDREW , a menswear blogger + budding Australian accessory / silversmith told me about his exciting collaboration with the author of dirtyflaws I was very happy. Collaborate and create is always the key and this one is an exceptional team-up..
Drawn&Quartered has been entirely established online. I've been in contact with Nikki Moose for a couple of years, sharing the online experience, sending her products to share with her readers and learning about effectively blogging on The Boys for boys. We got along so well that we began chatting all the time and D&Q always got a great response from her followers. So I approached her with an idea for this collaboration and it developed quite organically, things worked and other things didn't but the results speak for themselves. I guess it came out of a friendship and respect for one another, it's exciting to work with people who get what you do and who look good in it! What was your inspiration? What is the meaning of fangs behind the concept? Dirty Flaws. Nikki's blog has evolved a lot and so has her style. More specifically, the inspiration came from the desert. I had in my head the textures of the landscape, cracked earth, sand dunes, erosion, how hostile and violent it is. While designing it didn't seem enough to only mimic those textures found on pieces like V, VII and VIII. I began to consider what and who lives in such a place. They're not really fangs, I like to consider them beastly but open for interpretation. On the bangle for instance they look more like ox horns or they could also be pincers like those of a scorpion. I wanted them to feel as though they were crafted by people of the land who were influenced by their surroundings. What music did you listen to in the design process of the pieces? hmmmm it's hard to say. Usually in the studio I like to listen to soundtracks from movies like Natural Born Killers, The Exorcist and movies by people like Gregg Araki and George A Romero. I did listen to How Do You Fell by Zebra Katz ft Michele Lamy because there are a few creative people like her that will always influence my work in some way and I like to think "would they wear this?" as I design. How do d&q operate? Do you do things all by yourself or you have a team? In terms of design and production I do that myself. I have a few people across the globe whose opinions I highly respect and they see the process as I ask for their opinions. It's important though to find the right people to do the rest. For instance, I wanted Char Alfonzo to shoot our look book. He's an incredible photographer film director whose work is always on point. Char was given creative freedom over the look book and his direction of the styling, makeup and lighting created what you see and it perfectly represents the collection. I suppose in terms of a team, yes there is one. I don't have staff or an assistant or intern, I may conceive the ideas and do all the physical labor but I feel it's important to share my ideas and listen to those whose voices I respect for my work to achieve it's full potential.